Perfect for any impromptu gala! Venetian-style costume masks w/ handles. Fun to color for creative classroom play! Venetian-style costume masks with handle. 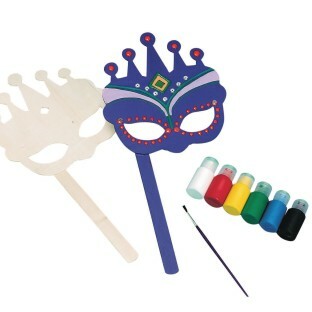 Includes wooden masks, paint, brushes and instructions. 14" x 7". I used this item for a crafts class. We painted them for the upcoming Mardi Gras season. I also purchased a bag of Faceted Acrylic Gemstones to embellish them with and they turned out incredibly beautiful! We have a princess class for 2.5-5 years old that this product worked perfectly for the kids loved it! Used as summer camp awards- a great painter will make this a great product otherwise it may seem flimsy and not worth it. Could be fun for kids to paint!